The perfect light and crispy breakfast is here! 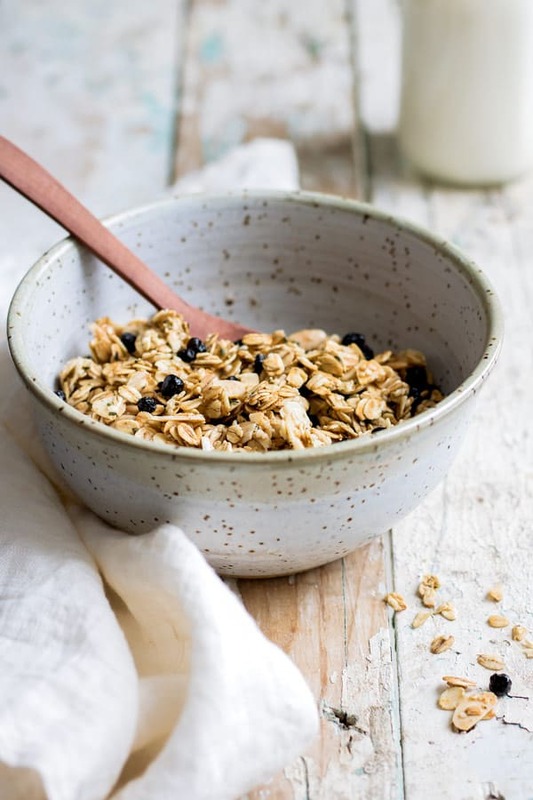 This blueberry, maple & vanilla bean granola is made with simple ingredients and goes perfectly on top your favourite yogurts, smoothie bowls or just in a bowl on its own! 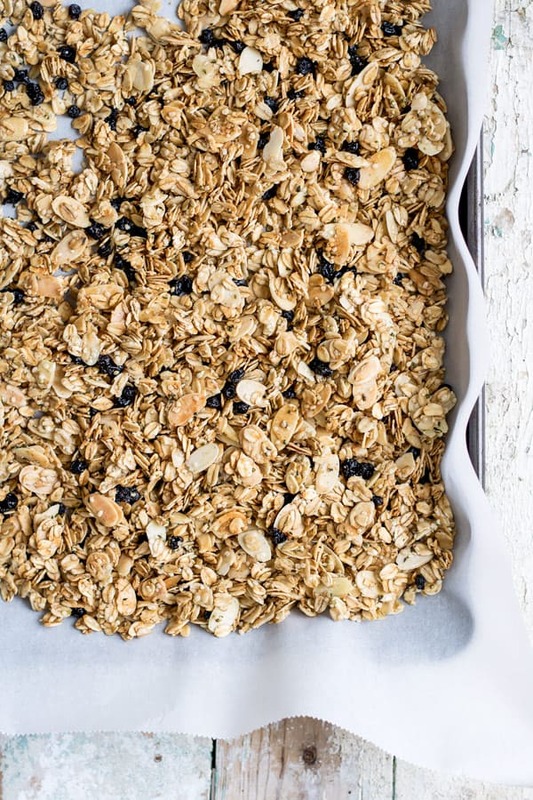 One thing I like to make on the reg in my home is granola. Besides the fact that it tastes deee–lish, it fills the whole house with that sweet baking smell. It’s that perfect smell that just draws you to the kitchen waiting for what’s about to come out of the oven. 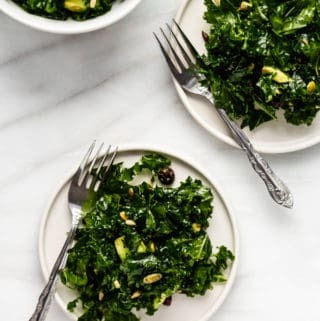 I used dried wild blueberries in this recipe, but any dried blueberries work great! You can even use any alternative dried fruits you love. I always love looking up what types of granola other people are cooking up. 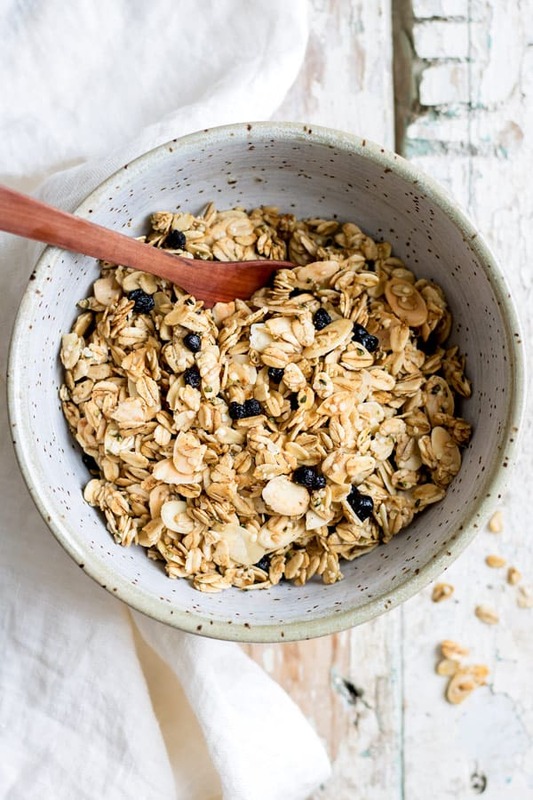 I’m always inspired by great granola recipes, like this one from 3 fois par jour, and this one from my new roots. Two fellow Canadian bloggers who I love! 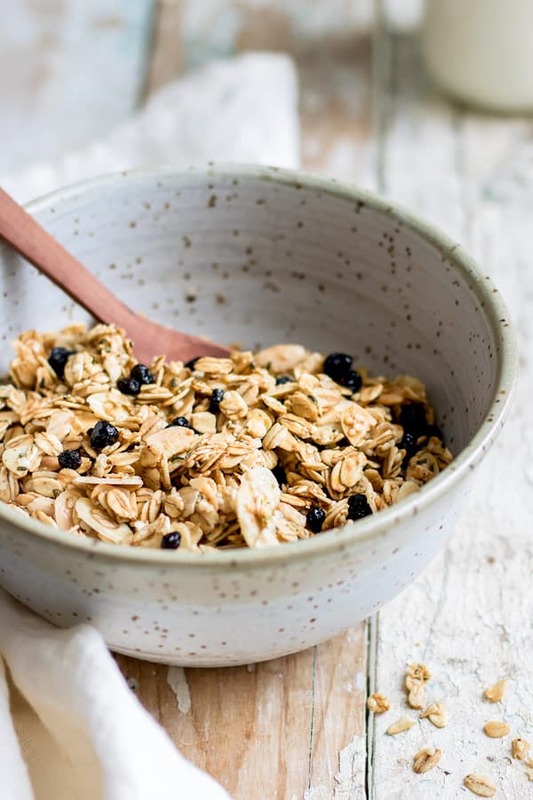 I use a mix of sliced almonds and hemp seeds in the granola to add some bulk and protein to it, but you can substitute with any types of nuts & seeds you like, or even with more oats. Preheat the oven to 300 degrees F and line a baking pan with parchment paper. Mix the oats, sliced almonds, hemp seeds, cinnamon, and salt together in a bowl. Mix the maple syrup, vanilla extract and coconut oil together in a separate bowl. Pour the liquid into the bowl of dry ingredients and mix together until everything is evenly coated. Spread out evenly on the baking pan and bake for 25-30 minutes, until lightly toasted. Let cool then mix in the dried blueberries. 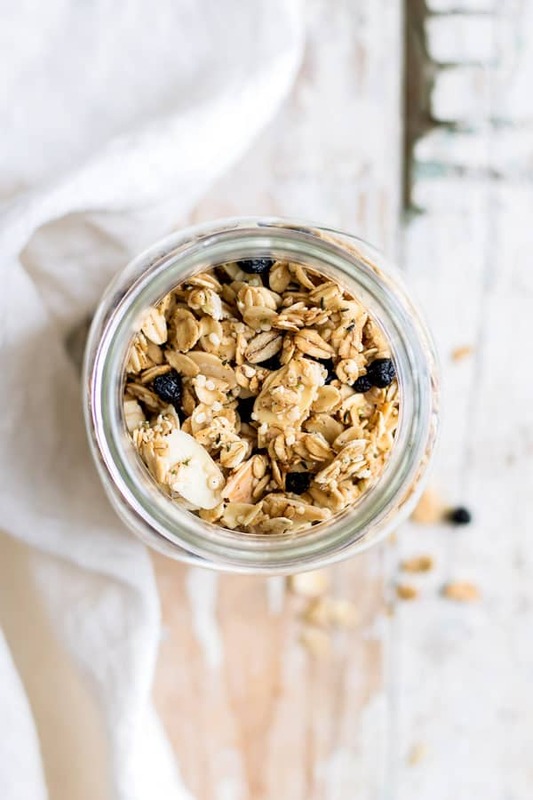 Store this granola in a jar or airtight container. 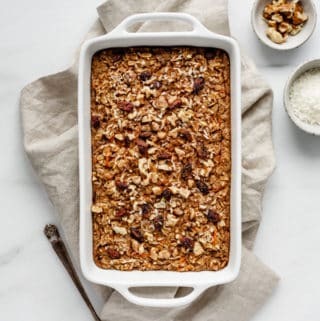 Add any nuts or seeds you like to this granola! 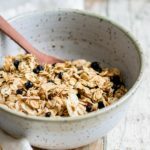 If you’re a big granola fan like me, here are some other granola recipes from the blog you may like: Rise and shine breakfast granola, Fig & walnut granola, & sweet and salty maple pecan granola. You had me at Granola! 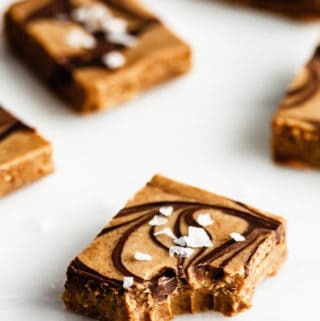 Looks so delicious and crunchy! Thanks Bianca! 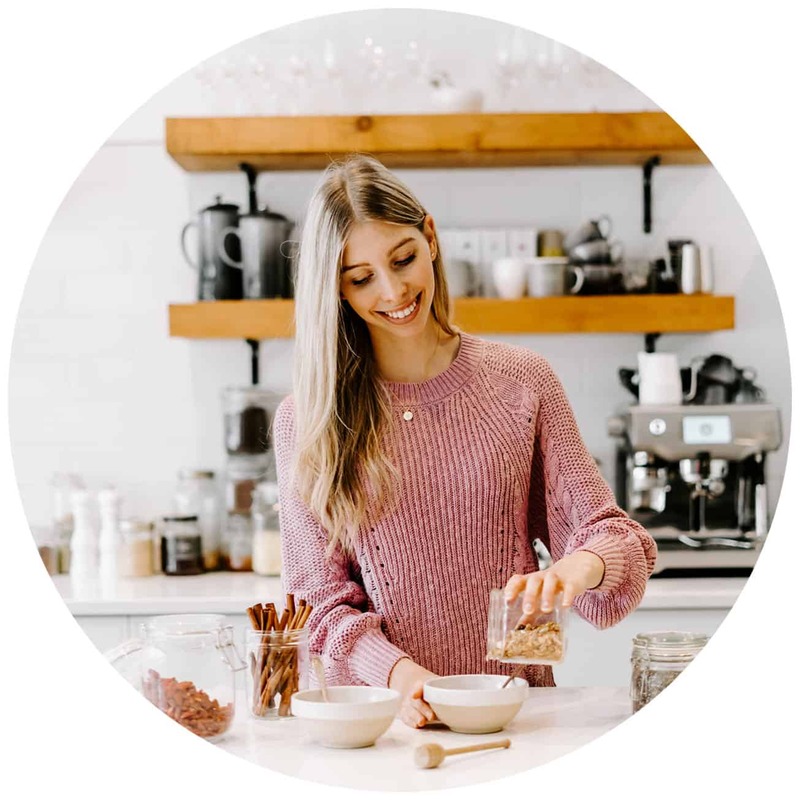 I love making homemade granola to top my smoothie bowls and oatmeal, or to just eat alone. It’s so quick and easy to make!